What if there was more to communicating with horses? Could you truly build a relationship of trust and confidence with your horse using feel, timing, balance, empathy and light hands? This is the new movie based on the life of Steve Halfpenny, the remarkable Australian horseman. 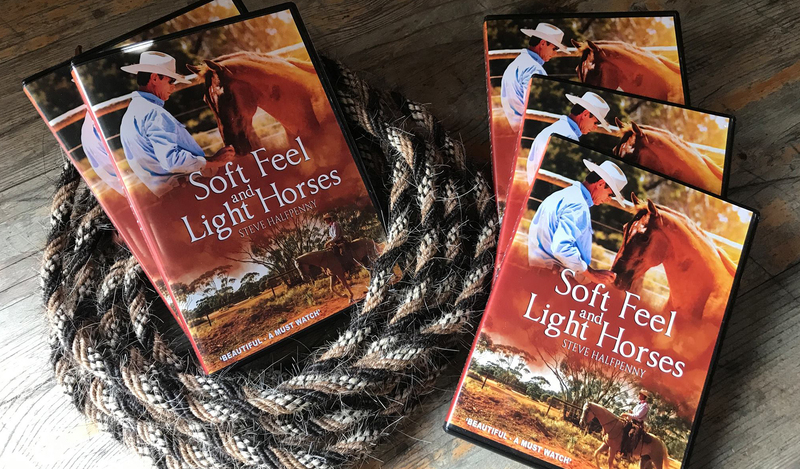 "Soft Feel and Light Horses" is directed by award-winning filmmaker Elaine Heney, with music by the Grammy nominated Mary Ann Kennedy, and features the award-winning equine artist Tony O'Connor. Many thanks to our sponsors Mitavite and Dash. 'Soft Feel and Light Horses' is now an award-winning movie, winning both the BEST DOCUMENTARY and BEST DIRECTOR Awards at the NYC Indie Film Awards in the USA. "I just finished watching this movie. It is brilliant! I highly recommend this movie to anyone who loves horses" - David M.
"Just seen this movie! It's amazing and I love the ending, it brought tears to my eyes. Fantastic photography" - Mary H.
"A beautiful, gentle film, exquisite horsemanship!" Melinda W.
"Great movie Steve, brought a tear to my eye in a couple of places. Thanks for sharing your journey, it is an inspiration and gives me hope! Thank you and see you in July" - Sue C.
"Great movie! Loved it, in particular the summarising at the end. Hearing Steve talk about his 12 year journey humbles me" - Helen B.
Steve Halfpenny is the founder of Light hands Equitation. He has been teaching his unique way of communicating with horses around the world for over 25 years. He is a #1 Best Selling Author, regular Equitana Australia presenter, and Senior Judge of Light Hands Dressage. His first short documentary has been selected for 13 film festivals and has won 10 awards, including Best Documentary and Best Director. Steve travels all over the world sharing his knowledge with students in Australia, New Zealand, the UK and Ireland, and has international students in many more countries. Many of the horses used in this movie are owned by Steve and Irena and live in South Australia. These beautiful Palomino horses have given demonstrations at Equitana Melbourne, and travel all around Australia with Steve in his work. We ship the movie DVDs worldwide, to Europe, Australia, USA + Canada, etc. All movie shipping is FREE. The DVD will play in Europe, UK, Ireland, Australia and New Zealand + USA + Canada. We ship both PAL and NTSC versions. Purchase today and we will ship your DVD to you asap! Can I watch this movie today? YES. Purchase today and get instant access to the online movie. Why is the price in $AU? The price is in Australian Dollars as this is an Australian website. However, if you live in USA / UK / Europe / worldwide, you will be charged the equivalent in your local currency (US dollars, sterling, euros, etc). Can I watch this movie DVD in the USA/UK/AUS/NZ ? YES. Our DVDs play worldwide. How many times can I watch the online movie? 24/7, as often as you like. How funny is the behind the scenes footage? It's very funny! We've had people laugh so much they were in tears. You get to see all of the out-takes, funny moments, behind the scenes secrets and a lot more! How can I learn more about Steve? You can attend a clinic in Australia, NZ, UK or Ireland, or join Steve's monthly online membership program. I write for a magazine or online horse publication. How can I get a review copy of the movie? Please email [email protected] with your request and we will be in touch soon. For all press and TV/podcast interview queries, please email [email protected] with your request and we will be in touch soon. MOST POPULAR OPTION: Includes over 4 hours of bonus content! Get the online movie, the DVD, the behind the scenes footage, extended student interviews, the Movie eBook and the Relaxed Rider online course. PLUS free shipping anywhere in the world. DIGITAL OPTION: Includes over 4 hours of bonus content! Get the online movie, the behind the scenes footage, extended student interviews, the Movie eBook, the Relaxed Rider online course. Get the online movie and the DVD - PLUS free shipping anywhere in the world. Enjoy an online copy of the film. Instant access worldwide. Watch 24/7 as many times as you like.